Anchorage as seen from my 22nd floor room at the Anchorage Hilton. Given that it was winter, I got an excellent rate at the Anchorage Hilton, which is located downtown. Thanks to online check-in, I snagged a room on the 22nd floor of the Anchorage Tower (the hotel has two buildings) with stunning views of the mountains that provide a beautiful backdrop to the city. Overall, I would rate the view from the high floors of the Anchorage Hilton as the second best view I have ever had in a hotel, the best being Twenty-One Whitfield in Hong Kong. However, with the huge plus of the amazing view, came a somewhat faulty heating system. Unwilling to trade the view for a functional heating system, I did get two blankets delivered – so including the one in the closet, I slept comfortably under three blankets. There were some downsides to the location – it was not within walking distance (at least in winter) of the two gay bars in Anchorage. I was too tired and/or cheap to get taxis to go. I did not rent a car during my first three night set because I expected to find enough to do within downtown Anchorage. This was, perhaps, a bit optimistic. The front half of the Anchorage Museum. If you have a Bank of America card, it’s free on the first Saturday of the month. 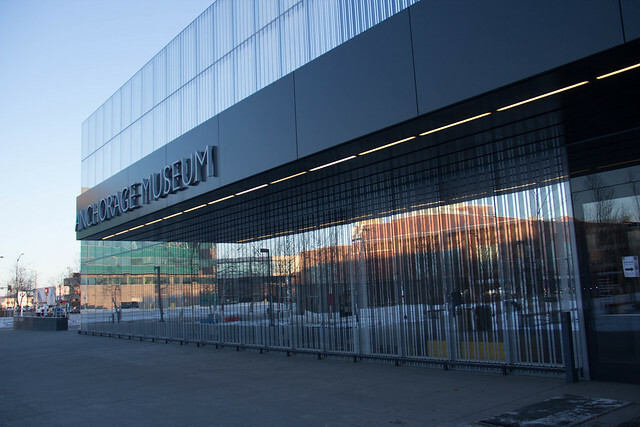 The key attraction downtown is the Anchorage Museum, which is in two parts: the back half that includes a lengthy exhibition on the history of Alaska, focusing on politics. The front half has a floor dedicated to the native communities, based culturally/geographically. This was an excellent exhibition. There were some temporary exhibits while I was there, the highlight being one called “Cabin Fever,” focusing on what it is like to survive winters in rural Alaska, especially in times past. Without a car, I found Sunday a bit dull. The second time I was in Anchorage I had a rental car. Let me say, up front, I’m not a fan of driving on snow, especially slushy snow. It’s actually rather anxiety inducing for me, so I was not necessarily in the best of spirits after driving around town. With the car, I made it to a number of places I wouldn’t have otherwise made it to, including the Alaska Zoo (small, but fun), the movies (I saw American Sniper on Valentine’s Day, which was surprisingly good and – considering that it was Valentine’s Day – packed), and a University of Alaska Anchorage Seawolves ice hockey game. The home team got smashed. Food wise, two places come up repeatedly in my research: Moose’s Tooth and Glacial Brewhouse. My word of advice: skip both. Moose’s Tooth was packed when I was there, but the pizza I had was unremarkable in every single way: the crust was entirely forgettable and the toppings (their own special creation) lacked any flavors at all. Glacial Brewhouse, on the other hand, was better – the food was flavorful and interesting, but paled in comparison to my favorite Anchorage restaurant. When the menu says this about the bread, you know the restaurant is actually going to be good. This is the asiago halibut dish that I ate — I’ll admit that I’m not a huge fan of tomatoes, but I ate some and the dish, as a whole, worked remarkably well. After discovering the F Street Station, I ended up going there a total of four times because it was so incredibly good. 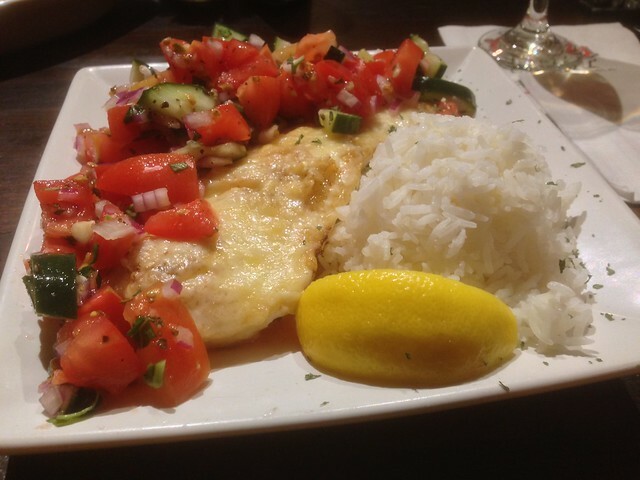 I had a special: asiago halibut, which was to die for. The fish and chips – perfect. The crab sandwich singlehandedly justifies a trip to Anchorage. My last meal there was a steak special that – I just cannot describe how good the meals at F Street Station were. 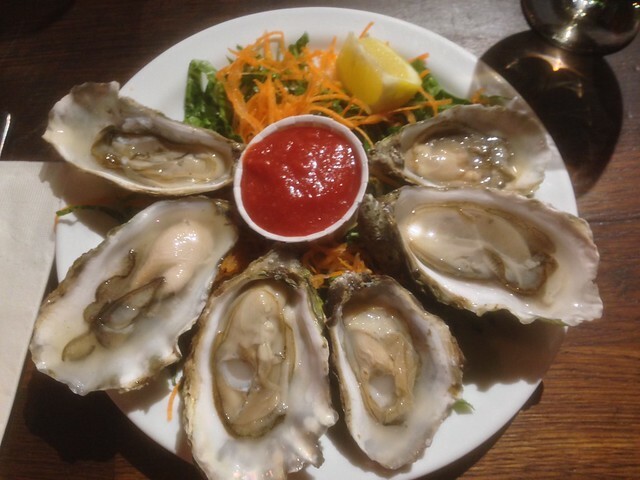 Alaskan Oysters, shucked right in front of me, when seated at the F Street Station’s grill. I would certainly visit Anchorage again – and I would make a point of eating at F Street Station again. But I would probably not brave Anchorage in the middle of winter again. Given that I do not like driving on snow, I would probably aim for September – hopefully before the snow falls, but after tourist season. More on Barrow in the near future. You’ve got a pretty high tolerance for cold. Must have been ridiculously cold for you to require 3 blankies. Sounds like the museum was better than the one we went to. Congrats on the 50th state! I think the room was about 60F… the heater was blowing lukewarm air, at best.